INTRODUCTION. The novel shapes and warm clay tones associated with ancient ceramic vessels are both wonderfully evident in Mihara Ken's sekki pottery. Sekki was a term used in the Meiji Period (1868-1912). It referred to yakishime, itself a term for high-fired unglazed pottery made of clay containing high iron content (Bizen, Shigaraki, Iga, and Echizen are all examples of yakishime). Although the term sekki is no longer commonly used, Mihara likes to call his work sekki, for his style is unlike that of other contemporary yakishime artists. At his EY-NET exhibition in August 2002, Mihara talked about his work and creative process. When I begin making a work, I picture some shape in my head. However, once I actually start, the shape keeps changing. I used to draw plans for a piece and make my work as similar to the plan as possible. That was before changing my style to Sekki. Back then I was trying to fit the clay to my style, or to control the shape of a piece. As I was doing that, the percentage of technical completion was increasing, but I was no longer excited about creating. Since I changed my work to the current style, I consider it my job to help the clay express its beauty. Clay leads, and my hands follow. I do not know what shape my work is going to end up even while I am making it. Nonetheless, a completed work is no more than my intentions. My intentions vanish once the piece is fired. Once in the fire, the piece is no longer mine - it has its own life and resolution. After the shaping is done, the piece is fired for 12 hours at low temperature, and then I cover the surface with fire-resistant clay. After that comes the real firing at high temperature for 40 hours. The clay covering does not shrink much, so it peels off like the shell of a boiled egg. By covering a work with clay, the piece does not get any ash-glaze from the direct fire. As a result, the work ends up having the texture of an old clay vessel with high durability. Yohen (kiln mutations) turn up naturally in the kiln.  Before firing, the clay is brown, and the iron in the clay reacts to high temperatures and turns to different colors. I cannot plan how the color changes. But if I fire the same way using the same clay several times, I would be able to guess. That would reduce my excitement greatly if I knew how a completed work would look, so to keep a fresh feeling, I use difficult clays or change my firing method. Currently, I am using clay found in my neighborhood in Shimane. I found some clay by my house after a typhoon, and the clay looked usable for pottery making. But that clay itself is not very stable, so I mix it with sticky clay. In order to make more satisfying work, I constantly change my firing strategy. For example, using stronger oxygen reduction at the end versus more oxidation. In other words, I fail in my firings almost all the time. Usually, the temperature goes up to a certain degree and then just falls naturally, but in my case, I use an oxygen reduction technique when the temperature goes down. My way of reducing oxygen in a kiln, I think, is distinctive. Because of the different firing, colors turn out differently in each firing. If I stuck to one way of firing, the overall level of technical precision would get better and better. However, I want to create pieces that convey excitement and passion, rather than to try to pursue technical perfection. A potter, I believe, must have a fresh mind to make works that arouse excitement. When a potter presents totally different styles of work at every exhibition, he can surprise and impress viewers. However, I believe the real service of a potter is to create works with the same style and, at the same time, to create pieces that excite the viewer. Viewers tend to like to see new works, while potters like and often need to dig into one style of pottery. Works that are improved upon, yet somehow connect to the potter's past works, can be created from finding a balance in what the viewers would like to see and what a potter wants to make. I try to face the creation process with a pure mind and with passion. I would like to excite the viewers with my works. I do not want them to admire my work. I myself have to be excited in order to create such work. When I began making sekki, I cared a lot about originality. But, as time went on, I noticed that what I was trying to convey was not originality, but something else. I also began doubting that it was possible to make something original, in other words, originality is falsity, I thought. So my shapes have changed a lot. But when I look back at my old sekki works in my current style, I notice my technique have improved, but what I really want to express through my work has not changed. Mihara selected his words very carefully and answered all types of questions with great sincerity. His work clearly demonstrates his attitude. 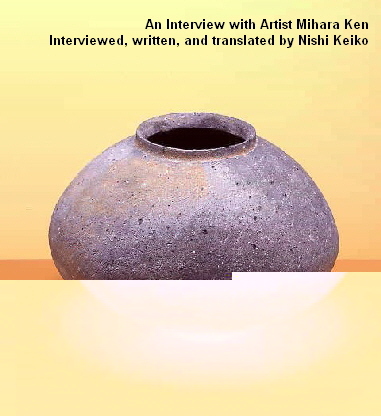 After speaking with him, I believe Mihara's way of creating pottery is free from prescribed concepts. I had a chance to see a photo of Mihara's old work before the current style. It is extremely delicate and beautiful. However, I find that his quiet and sincere, yet passionate, character are exhibited much more obviously in his current sekki works. His old works were also very well received. So I told him it must have taken a lot of courage to change a style. "My wife supported me all the way. Change needs only one person's support to keep on track" he casually said, like it was nothing special. Now he keeps making sekki, but he tries to change something at each and every firing. Not being restricted by concepts might be the reason he's not afraid to tackle both small and big changes. Yet, it is not like he tries new things haphazardly. He knows what he is doing and where he is trying to get. The changes are born along the way. When Mihara makes a work, he does not pay much attention to unevenness of the surface, but cares about the work as a whole. He looks at works by stepping back from them in order to get the whole picture. "You can see a beautiful line only after looking at the piece as a whole," he said. In case of an Impressionistic painting, for example, when one cuts out a 1cm. square area of the painting, they do not see any shape or figure, just pieces of colors put together. But, once the painting is looked at from a little further distance, beautiful people and landscapes appear on the same surface. Each of Mihara's work is just like that. And, the same can be said to all of Mihara's sekki works. When one sees his various works, they convey the potter's message or clay's message. Mihara's works are so silent and yet powerful because he earnestly listens to his inner voice and the clay's voice just as when he listens to other people. His attitude attracts people. A couple from Shiga, and Mihara's long time fans, visited the exhibition. They happily told me, "If we like a work of Mihara's, we must get it. Otherwise, at the next exhibition, he will create a totally new world." Mihara also said that he gets disappointed when a viewer says that his new work is no different than at his last exhibition. He keeps tactfully betraying his fans' expectations in presenting uniquely gentle, and yet strong works. We -- Mihara's fans -- hope for his continuous betrayal. It will most certainly keep us happy and excited with changes, and at the same time with Mihara's artistic consistency.